Recently Chicago’s Goose Island Brewing Company invaded Texas with their line of beers. I wonder if this had anything to do with the enemy, Anheuser Busch buying them out recently, making their product easily available all over the US. 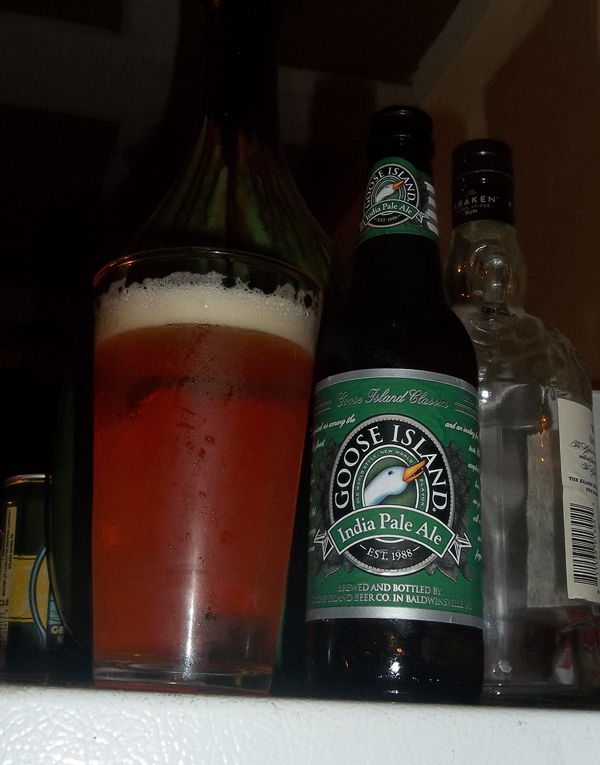 Usually I don’t like to support any beer product that is made by, or sold by the big 3 (Anheuser Busch, Coors, and Miller) but I really wanted to see if there was anything good about beers by Goose Island. I bought a couple of different ones, including this India Pale Ale. Poured into a pint glass, the beer poured a clear dark orange with an off white one finger width foamy head that lasted a good while leaving a nice lacing on the way down. It really is a good looking beer. The aroma of the beer is full of hops. Al citrus and floral aromas. Nothing extraordinary here at all, just plain ordinary for an average IPA. The taste is exactly the same as the aroma, full of hops, all citrus and floral tastes. Again, nothing extraordinary. Just a well balanced, average IPA. The body is light and dry. This is what it is, a gateway IPA, in my opinion. I can see the average big beer drinkers raving about how great this beer is, or that it has too much hop flavors, etc. But for us hop heads, and fans of the out of the normal IPA, this is a beer that will be liked, but not loved. Now I am not just saying this due to the tie in with Anheuser Busch, I am saying this cause this is how I feel about this beer. What came to mind musically, is the overall raw power of the band CIANIDE! I am fan of their older material, and their slower stuff, but I found myself really digging this tune called “Contained & Controlled” off their 2011 album Gods of Death. Cianide was a perfect choice since this brewery originated in Chicago, where this band is from. Goose Island Brewery and the band, Cianide both established themselves in the year 1988. I’m sure Goose Island will be available in your local grocery store soon, so pick this one up, enjoy this IPA, and jam out to some old school Metal!